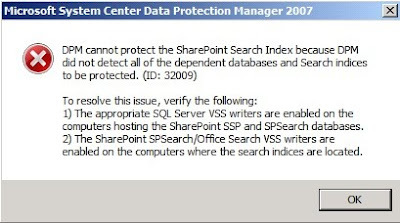 When you're adding sharepoint in protection group for DPM 2007 SP1, you will see Error ID: 32008 and 32009. "This Windows SharePoint Services Farm cannot be protected because DPM did not find any dependent databases and search indices to be protected. (ID: 32008)"
One of the common problem is because previously you have added sharepoint database (SQL) into the DPM protection group. You need to need to remove the MOSS database from the protection group. When you're adding sharepoint into the protection group, by the default DPM will use sharepoint writer to protect the database as well. So it advisable not to set sharepoint database into protection group. 2. Open the PG again, select back the SP databases under the Sharepoint link and voila! :D no more 32009 error..
Glad to assist. Thank you for your valuable comment.